Arron Lilley is loving life as Lancashire’s pinch-hitter in the T20 Blast but the off-spinner admits he wants to be much more than that. The 27-year-old has been promoted up the Lightning’s order to number three for much of the last two campaigns to clear the ropes. And this summer he has returned a number of notable contributions highlighted by scores of 42 not out and 47 in Roses wins over Yorkshire - both career bests. His scores have gone a long way to ensuring the Lightning have qualified for the quarter-finals with one North Group game still to play, against Birmingham Bears at Edgbaston in front of the TV cameras on Wednesday night. A win would make them favourites for a top-two finish and a home quarter-final. Lilley and the majority of his team-mates have extremely fond memories of Edgbaston given they won the 2015 Blast title there. “I’ve been given that role to go out and try and play a few shots,” he said. “I hit the ball in different areas, so it’s difficult to bowl at. I’m enjoying it, it’s good, it’s a bit of freedom for me. 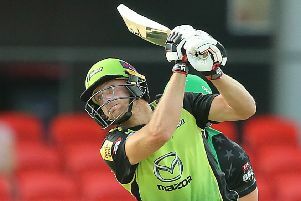 “Hopefully I can get a few more big scores and get us through to finals day. “I’m trying to get better as a player as well. I have to take that step now. “The team, the captain and the coach are backing me to bat at number three, so the belief is there for me knowing I’m good enough to do it. “I think I’ve bowled about seven overs. Obviously I’d like to bowl more, but if the team keeps on winning that’s fine. “But if the team’s winning, we are all for it. We’ll do anything for the two points. Lilley was an ever-present for the Lightning in 2015 and he believes there are a lot of similarities that can be drawn between that campaign and this. He added: “I think we are a bit younger this time. “We had a bit of experience last time with Ashwell (Prince). “But I think skill-wise and ability-wise, we are right up there. In terms of spin, we’ve got Parky (Matthew Parkinson) now, and obviously Zahir (Khan) is a bit of a magician. “The lads in the batting lineup at five, six and seven, they’ve not really batted that much because the top order has done so well. Birmingham need a win to keep their slim quarter-final hopes alive.